This guide will show you how you can start using Axinom DRM to protect and play back premium video content. A separate repository also contains an Android frontend that interoperates with this sample project. This chapter presents a high-level functional view of DRM concepts. Understand that there is a lot more happening under the covers, especially in the realm of security and key management. The media samples in a protected video are encrypted with one or more content keys, each referenced in the video metadata by its unique key ID. To play the video, a DRM-capable player needs to decrypt the media samples. 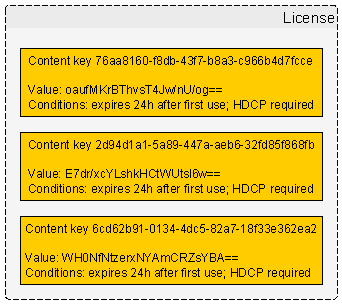 For this, it needs access to the content keys, which are delivered in a license that also defines the conditions under which the content keys may be used (e.g. expiration). The Axinom DRM license server will give a license to every player who can prove that they have the right to get a license. The player proves this by presenting a license token obtained from an authorization service whose responsibility it is to make such decisions and to obtain the appropriate content keys from the key server, attaching them in a secured form to the license token. 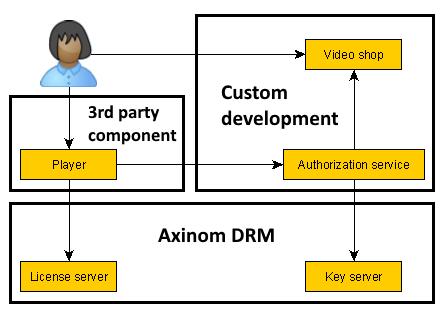 The Axinom DRM product suite includes both a license server and a key server, offered as cloud services. The remaining parts of a DRM-enabled solution must be either 3rd party products or custom developed components. The diagram below illustrates the most common setup. You will want to use a robust and reliable player that provides an optimal playback experience. dash.js integrates natively with Axinom DRM and can be used in all modern browsers that contain a compatible content decryption module. On Android, ExoPlayer is the recommended player. The player ecosystem on other platforms is less straightforward – Contact Axinom for detailed player evaluation guidance. In the first scenario we explore, everything has been prepared for you – there exists a small website that has a single video that you can watch. All DRM information has been prepared for you and hardcoded into the application. The supported browsers for this sample app are Google Chrome, Mozilla Firefox, Microsoft Edge and Microsoft Internet Explorer. Only the latest version of each browser is supported. Follow the instructions below to run this sample project and go through the first sample scenario. Clone or download this Git repository (the one that you are currently reading). 6. If everything went well, the output from this command will instruct you to open http://localhost:8120 in your browser. The first sample scenario is very simple – once you open the website, there is a single “Axinom demo video” link presented to you. Clicking on this link will play a protected video. That’s it – go give it a try! The sample project implements a basic website that enables the user to select a video and play it in a modern DRM-capable browser. By default, there is only a single Axinom demo video in the list but the later chapters will show you how to add more. Server.js – creates an HTTP server that publishes the website, the catalog API and the authorization service. VideoDatabase.js – defines the list of videos made available to the user. The catalog API simply returns whatever videos are listed in VideoDatabase.js. By default, there is just one video titled “Axinom demo video”. The authorization service will authorize every request, as there is no need to actually refuse playback in the sample scenarios. There are comments in the code indicating the location where actual authorization checking logic would go. 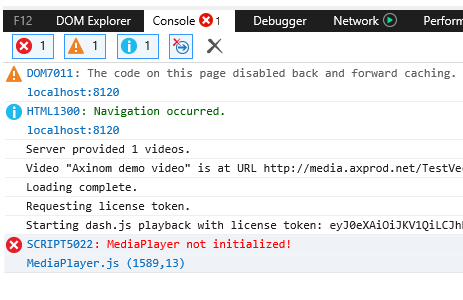 If the website requested permission to play “Axinom demo video” then the authorization service simply returns a hardcoded license token. This is a special case to keep the first sample scenario very simple. Other scenarios introduced below will use a more realistic workflow. 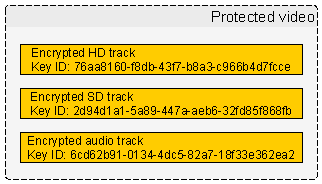 The player detects that the video is protected and takes care of any further DRM logic and license server communication. The code is thoroughly commented, so the above is only a high-level overview. To understand the details, explore the source code! In this scenario, we will modify the sample project to generate a unique license token upon every request, instead of returning a hardcodedg license token. You will need an Axinom DRM evaluation account in order to proceed. Upon signing up, you will receive a document titled “Axinom DRM Fact Sheet” that will contain some information required below. 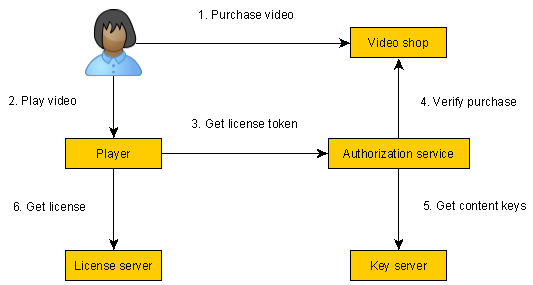 To modify the project for the second sample scenario, open VideoDatabase.js and remove the hardcoded license token from “Axinom demo video”, replacing it with a keys list that matches the data shown below. Now, create a file Secrets.json based on the sample below and place it in the same directory as Server.js. Replace the example data below with real values from the Axinom DRM Fact Sheet. Having created the Secrets.json file, you should see a message about it being loaded when you start the application. That’s all you need! The authorization service will now generate a unique license token upon every request. Run the application, open the website in a browser and go play the video! The logic for generating license tokens is already provided in AuthorizationServiceApi.js and this functionality is activated by the instructions above. In order to generate a license token, the authorization service needs to know the IDs and values of all keys that are to be made available to the user. Note: this pattern of key management is simplified compared to actual production use. See the chapter on security below. The communication key secures the transfer of sensitive data (content keys) from the authorization service to the license server and authenticates the license token, making it impossible to forge. 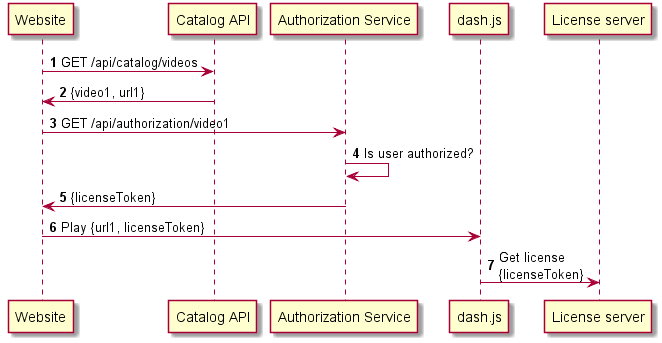 See the code in AuthorizationServiceApi.js to understand the details. In this scenario, we will modify the sample project to play back videos that you create. As a prerequisite, you must already have performed the sample project modifications described in sample scenario 2. 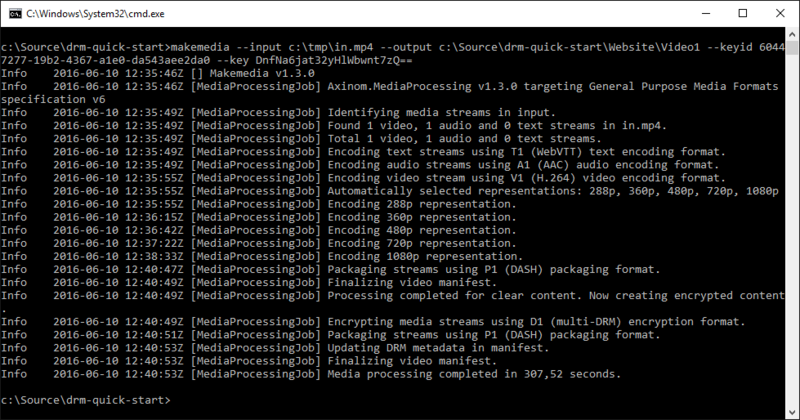 One package available to you in the Axinom DRM customer portal is a command-line utility called Makemedia. This is a reference encoder and media processing utility made available to you for use in evaluation scenarios. You will need to download this utility in order to proceed. The starting point for this scenario is an MP4 or MOV file containing both video and audio – ensure that your video is in this format before continuing. You can download some free test content in this format from the Blender Foundation. The steps below will transform this input video into a format suitable for playback. Wait for the video to be encoded, encrypted and packaged. This may take up to 24 hours for full-length movies, though only minutes for short clips. The output location will have two subdirectories: Clear and Encrypted. For diagnostic and troubleshooting purposes, a clear variant (without encryption) of your video is generated side-by-side with the encrypted variant. The sample project website will correctly serve DASH videos if the output files are placed under the Website directory, as in the above example. You may also use external servers but as web servers require some configuration in order to correctly serve videos, using the sample project is the easiest option to start with. Having created the video, add the relevant entry to VideoDatabase.js. You need to provide the name, the URL to the Encrypted/Manifest.mpd file and the details of the key used to encrypt the video. That’s it! You can now start the application, open the website and play your video! Follow the same process to play videos created with 3rd party tools. As each media processing product operates differently, universal instructions cannot be provided here. Contact Axinom for detailed support in setting up your media workflows. The authorization service shown here authorizes every user for every playback request. If this does not match your business scenario, you need to create the relevant checks that ensure license tokens are only granted to viewers who are authorized to play back the content. Your website or client app must use HTTPS in order to protect against the interception of communications (e.g. to steal the license token generated by the authorization service). You must carefully plan the life cycle of license tokens to match your business scenario. While the sample project requests a license token immediately before playback, this need not always be so. Some scenarios may benefit from long-lived license tokens generated well in advance of playback, thereby reducing network traffic for authorization checks. On the other hand, long-lived license tokens enable a greater degree of misuse if they are ever stolen; short 5-minute license tokens enable a stricter level of control for scenarios where that is a concern. In a high-security production scenario, it is not desirable for the authorization service to have access to content keys. Instead, only the Axinom key server and Axinom license server should possess the content keys, with the authorization service embedding them into the license token using an encrypted key container. The relevant interactions are currently not demonstrated by this sample project. Content owners may require you to use different keys for different tracks and quality levels, though this is usually only required when working with very high value content (e.g. Ultra-HD or 4K video). Ensure that your content production workflow is capable of this. Contact Axinom for detailed support in setting up your production deployment.